Ahead of Brazil's quarter-final tie against Belgium, former striker Ronaldo talks about Neymar's performances and of course his theatrics at the World Cup in Russia. Neymar and Brazil have reached the quarter-final of the ongoing Fifa World Cup 2018 without stuttering unlike the other big boys of world football. Tite's men haven't been flamboyant but have just done enough to keep themselves in contention for the ultimate glory. However, the biggest talking point of Brazil's campaign in Russia has been Neymar's theatrics. While the media has come up with scathing headlines, fans have flooded the internet with hilarious memes, slamming the Paris Saint-Germain star for diving, rolling and exaggerating fouls. Neymar was close to his best in the Round of 16 win over Mexico, scoring a second-half goal and setting up one for Roberto Firmino but his histrionics did not go down well with fans or the opposition players. The 26-year-old embarrassed himself when he came up with an over-the-top reaction after Mexico's Miguel Layun gently stepped on the Brazilian's ankle when the ball was out of play. 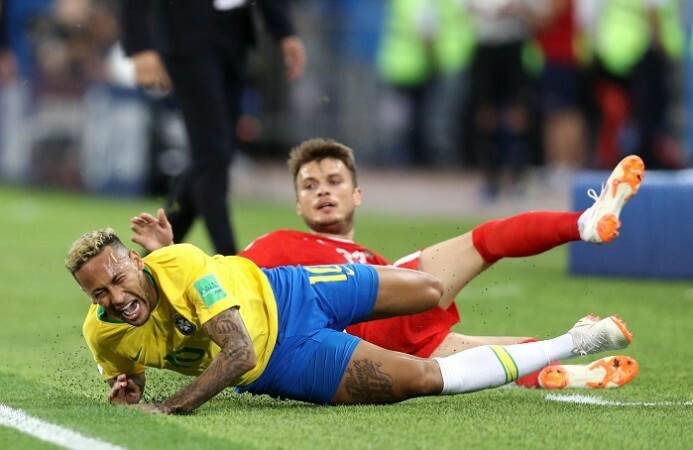 The game was stopped even as Neymar was rolling on the grass but the referee refused to buy into his exaggerated reaction. As it turns out, Brazil legend Ronaldo has been finding all the memes about Neymar "funny". However, the 41-year-old, who had won the Jules Rimet Trophy twice with Brazil, insists he is only concerned about the performance of "his friend". Conceding that he is a huge fan of Neymar, Ronaldo said that the youngster is capable of winning year-ending awards if he manages to lead the Selecao to World Cup glory in Russia. "You know what, the internet is so fast and all the memes going around is fun, fans are doing a lot of things that are not important," Ronaldo told ESPN. "The former striker added: I am a huge fan of him. Of course and he is my friend. But analyses about him is just about when he is playing. I can tell you what I think about him when he's playing. He is one of our biggest talents. He is still improving in the competition. I hope he can do better." "I think if he can bring the title for Brazil, he has a huge opportunity to become the best player of the year," he said. Gabriel Jesus or Roberto Firmino? Meanwhile, Ronaldo also defended Tite's preference for Gabriel Jesus over Roberto Firmino. Questions have been asked about the coach's decision to leave out the Liverpool forward on the bench, given the former's goal drought in the ongoing tournament. Firmino is being used as an impact sub and he delivered for the team against Mexico, scoring the second goal of their 2-0 win. "I think Tite is very happy with Jesus' performance. Of course, he hasn't scored yet but he has run a lot and helped the team a lot," Ronaldo said. "Brazil is good because they help each other as a team and you know still we have Firmino on the bench. He is fit and he has scored and ready to play whenever he gets an opportunity. "We have two great players for one position. Tite, I am sure, will choose the best one." Tite's men will face their biggest test of the World Cup yet when they take on Belgium in the quarter-final on Friday, July 6.